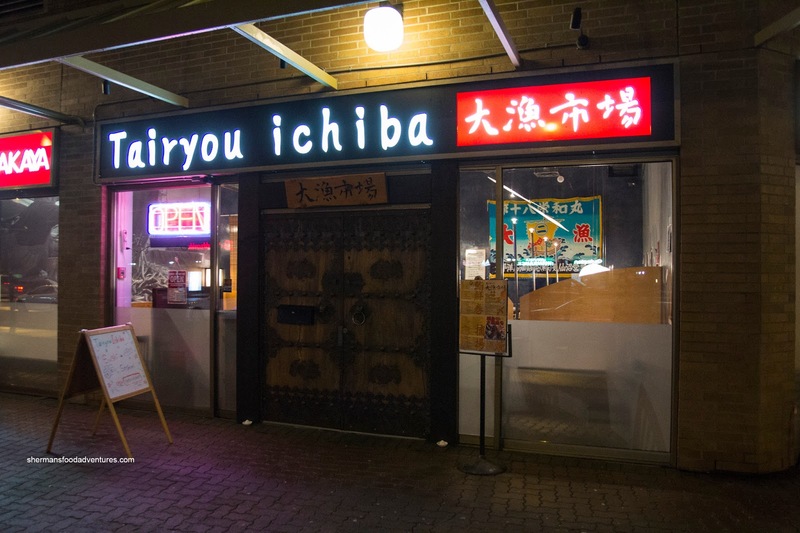 "That restaurant with the big wood door", exclaimed Mr. X as queried where Tairyou Ichiba was located. Oh yah, the place formerly known as Kura right next to Bubble World on Kingsway. Heck, I never got to try Kura before it closed... Oh well, I guess Tairyou Ichiba it is. I always assumed that the inside would be nicely appointed because the big wood door looked so majestic. However, when I walked in, the place looked much more sparse than I could ever imagine. It's like someone with caked-on makeup, waking up the next morning could result in a total surprise! Anyways, I was here to try the food, so the decor was not really all that important. Another thing I realized pretty quickly was the relatively low prices. This could mean one of 2 things, either this would be a great deal or mediocre food. I guess we'd need to eat to find out! 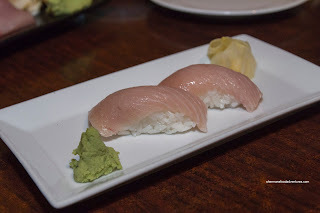 We started with the Toro Nigiri, which was okay in terms of the fish - it had a pleasing texture and taste. But the rice was not my cup of tea. It was dry and salty. Yes, salty. Not something one would associate with good sushi rice. That was further exacerbated by the overwhelming amount of it in the Aburi Salmon Oshi. I gotta declare that Miku and Minami have nothing to fear with this version of the dish. In fact, they might want to encourage people to try it at Tairyou Ichiba so they can see for themselves how good they have it at Miku and Minami. This one here had enough rice to make 2 portions let alone one. Yet worst of all, they put slivered raw onions atop the barely seared salmon (only 2 pieces and on one corner). 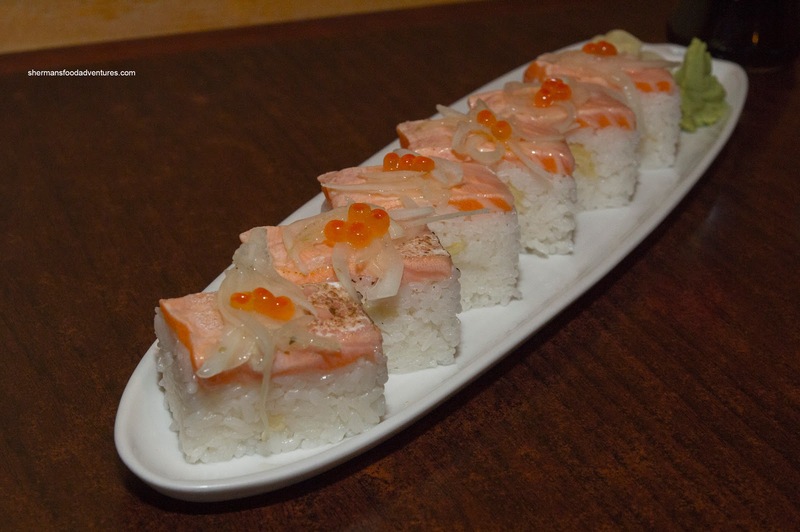 The sharpness of the onions, as well as the plethora of pickled ginger in the pressed sushi, totally overwhelmed the salmon. Moreover, there was an absence of moisture which made it hard to eat. It really need some sauce. This was a complete fail in my books. Moving on from the terrible roll, the meal was actually half-decent. The Assorted Sashimi (for a reasonable price of $28.00) was better than we expected. Nothing on the plate was bad, in fact, some of it was quite good. 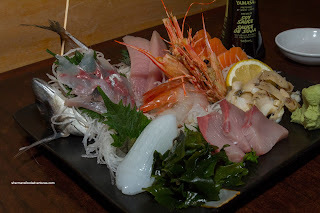 I especially liked the Amberjack and Hamachi. Not really all that enthused about the Tuna as it was not a good mushy. The fried shrimp heads were a treat though. 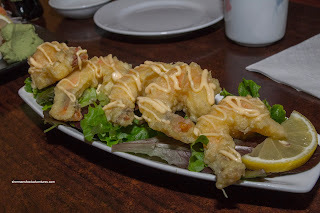 Although the batter for the Ebi Mayo was not crispy enough for our tastes, the dish as a whole was decent. The shrimp were large, deveined and had a decent snap. I would've preferred to have more mayo because there was an overall lack of flavour and moisture. 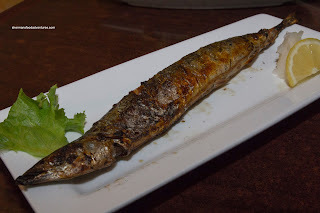 Lastly, we had the Grilled Saba and it was done nicely. It had a nice char while still being moist inside. For the items we tried, most were acceptable except for the sushi as the rice was not very good. Personally, I believe the one thing that will attract customers are their low prices. Too bad you never got to try Kura. It was so good!! +1 to MBSunshine ..... Kura was good indeed. Maybe not quite like Ajisai in Kerrisdale but not bad at all esp. during dinner. So is Tairyou Ichiba just a new branding concept by the same owner, or did they undergo ownership change too ?